Hello! 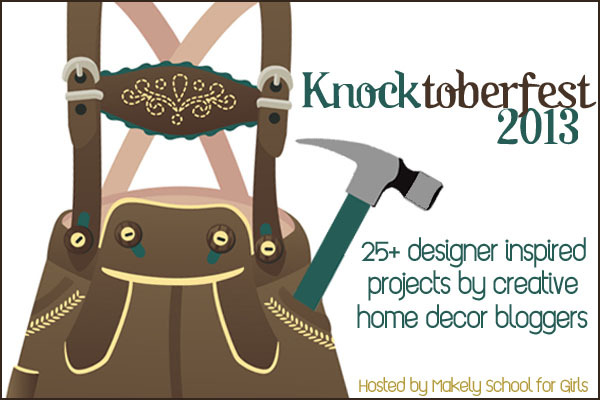 I am thrilled to be joining Lindsay from Makely and 25 other bloggers for Knocktoberfest 2013! We’re on a mission to make less expensive versions of our favorite designer décor items and today is Day 4. If you are coming from Remodelaholic and her amazing table knock-off, welcome! We are Star Wars lovers in this house. I saw this death star LED artwork in Pottery Barn kids catalog and thought: hey, I could probably make that for less than $299! Did I mention they will also cut it for you for free? Love them. Paint around the edges with some black craft paint. I found a high-resolution picture of the death star on the internet and ordered a 36”X48” engineer print from Staples for $7. There will be some white on the top and bottom, but just cut it down to size. Attach the print to the board with spray adhesive (leftover from projects here, here, and here) : I rolled up the bottom to the middle, sprayed, and then smoothed it out as I unrolled it. Then repeat for the top part of the print until it’s all nice and stuck on. May I give a bit of advice here? Don’t use mod podge!! Well, maybe if you are mod podge expert. And then I had to order another print. Boo. I just turned it over and used the other side. It’s okay if your holes aren’t perfect, it’s like a Christmas tree. When you turn on the lights, everything looks pretty. It’s looking gooooooood. Let’s take it downstairs to the boys’ room. Yessssssssss. A savings of approximately $283! Are you ready for more? Head over to Vintage Revivals where the amazing Mandy will show you how to make an $800 West Elm rug for around $60! To see all of the projects, click over to party central at Makely. This is AMAZING!! Thank you for sharing! I'll be making this for my son's room, possibly for a birthday or Christmas present! Thanks again! This is so awesome! Thank you for sharing!!! I too fell in love with the PB one when we bought our bedding sets for the boys room, but couldn't part with that much money. I'm going to be making this next week... can't wait! This is fantastic! We are getting ready to redo the boys' room and my oldest loves Star Wars. Also, I second the Mod Podge comment. I ruined my favorite poster trying to mod podge it onto a canvas. :( Bubble city. Boo.